$79.99 KidKraft Vintage Play Kitchen, Pink - dealepic . This KidKraft Vintage Play Kitchen, Pink features microwave and oven doors open and close, oven knobs click and turn, cordless phone, removable sink for easy cleanup of this pink toy kitchen. 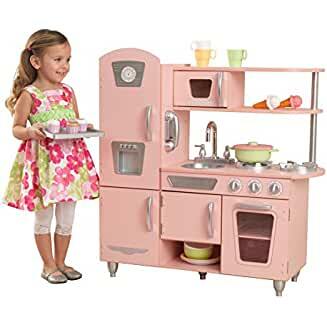 Young chefs will love cooking up feasts for the whole family with the wonderful KidKraft vintage kitchen in pink.